Following the lifting of wartime building restrictions, coupled with the massive leap forward in new materials and technologies, an infinite variety of building forms became possible. 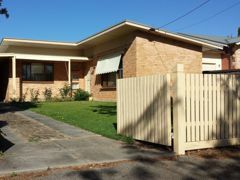 The postwar period saw the rise of the brick veneer house throughout the outer suburbs. For the first time properly engineered and individually designed concrete footings and prefabricated roof trusses were employed. 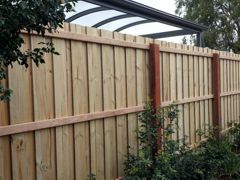 Plastics now appear in the form of PVC water and sewer pipes, guttering and downpipes and polyethylene sheeting is used for damp-proof courses in brickwork. Over time, the wooden box frame window develops into steel frame, then later still, to extruded aluminum. 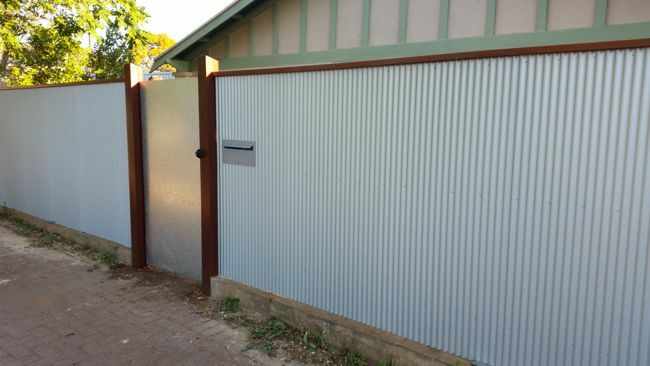 Roof and ceiling insulation materials make low pitch roofs practicable, and roof coverings change to asbestos, cement and terra cotta tiles and shingles and then back to iron in the form of low pitch steel decking and continuous corrugated sheeting. Although this enabled a departure from conventional hip or gable roof designs the form and function of our homes remained, in the large part, conservative and traditional. It is in the lifestyle change of the home unit or townhouses where modern domestic architecture has become more adventurous. 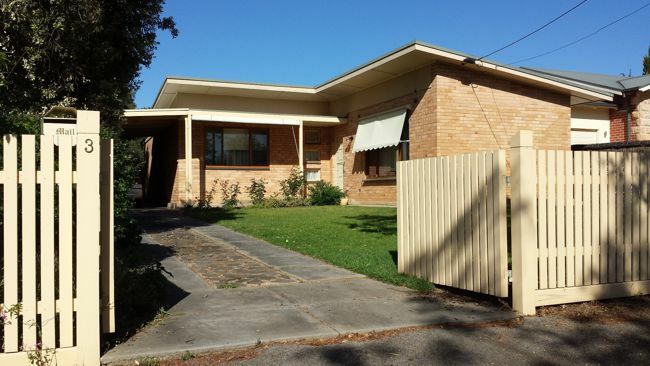 Adelaide's first home units were built in 1958 and the first Strata Title development began in 1968 when colonial style units were built in large numbers throughout the eastern suburbs and the seaside areas of Glenelg and Brighton. Here are some of the house styles as described by their popular names and within the decades of their development. 1950's: Two styles the "Contemporary" and the "Conventional" both included broader eaves, larger steel frame windows and bigger room sizes than the previous era. 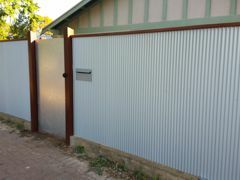 The Contemporary was a more challenging design using a low pitched skillion roof of metal or asbestos decking. Later the roof line was to split into two directions and often around a feature freestone chimney. 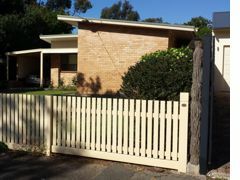 Exposed timber paneling was often used as bands between the more structural cream brick. They were American led in design, older readers may remember "The Brady Bunch" residing in one. They were adopted by the Housing Trust that continued to build them through the sixties into the seventies. The Conventional was invariably a thirty degree hip roof of cement tile, double fronted or triple fronted stepback, three bedroom home. 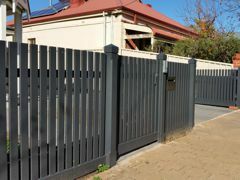 Common features include steel stanchions set into flower boxes to support a carport or entrance canopy roof and baked burnt brick in the base courses of the wall. The facade of the house was often dressed with thinly sawn Basket Range stone with the mortar tuck pointed. 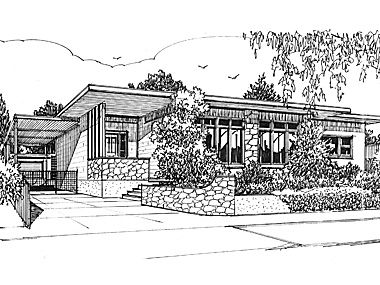 1960 - 1970's: New to the scene was the "Cape Cod" built of brick or random freestone, two stories with repeating dormer casement windows in a long Dutch gable end-filled with timber paneling. The "Ranch Style" was essentially rectangular presenting a wide frontage across most of the property; it had extended eaves and colonial style floor to ceiling windows. 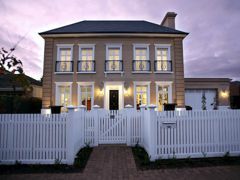 The "Colonial Style" was similar with the added features of curved and decorative fascias, twin verandah and canopy posts and bay windows. In the 1970's new allotment sizes changed from 65' to 80' with a corresponding reduction in depth allowing for a more impressive home to be built across the allotment. The first to take advantage was the "Spanish Style" an embellished contemporary house of the period. 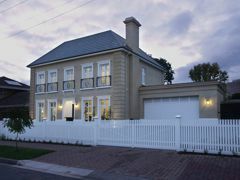 Rounded windows and arches, heavy terra cotta tiles, pergola ends emerging from white stucco plaster peppered with random vertical slits where the dominant characteristics. 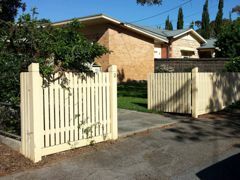 Many may remember the style; it was a dominant feature of Melbourne St, North Adelaide at the time. 1980 - 2000's: All throughout this time the Conventional hipped and gable roof designs of the preceding eras continued forward into the new decade. 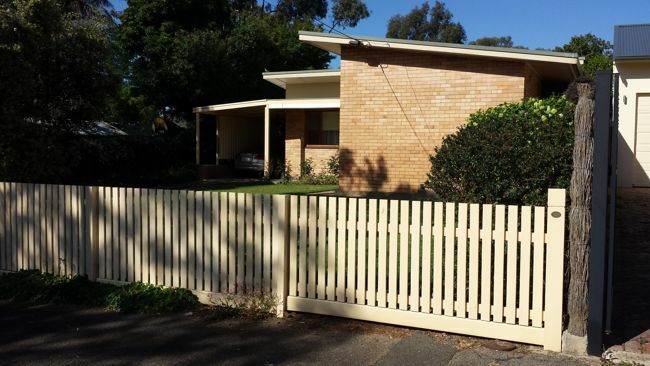 It becomes unwise to date homes from the seventies onwards as large building companies had basic designs and floor plans that allowed virtually any external treatment to simulate a given style. Further difficulty is added by the numerous "one off" houses being erected, often off unusual materials such as pressure treated pine logs, cedar shingle and mud brick. In addition, during this period, we unfortunately begin to look back rather than forward. Despite the leaps forward in building technology, and our ability to innovate and design for our environment, easy comfort is found in reproduction styles. 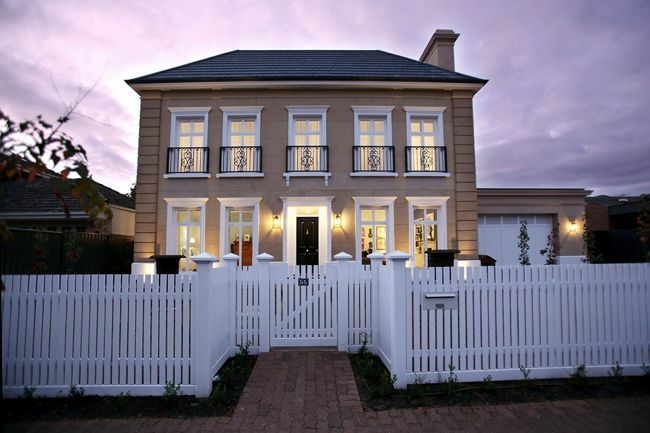 In the last few decades, stylistic treatments have seen reproduction Colonial, Victorian and Edwardian homes give way to Provencal and Tuscan styles. Our heavy dependence on the motorcar, coupled with the high density style of development on narrower blocks, has made the garage a dominant feature of our streetscapes. 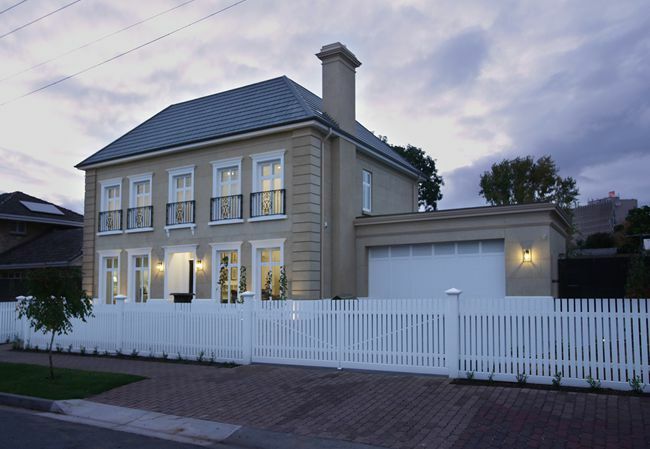 We also, despite living on smaller land parcels have a taste for larger homes with multiple bathrooms and a variety of new and specialized rooms and retreats; often referred to as "McMansions". 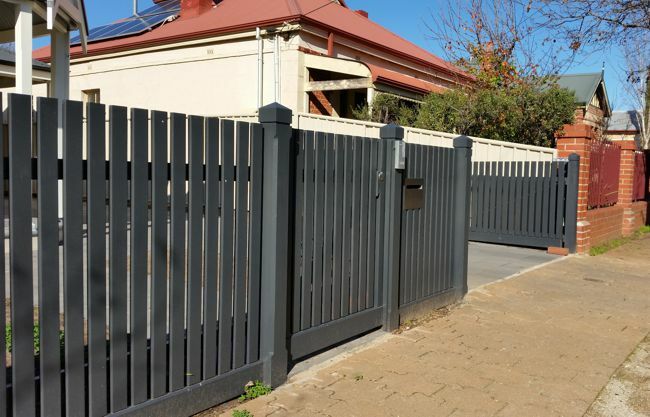 Choose Heritage Fencing in Adelaide for authentic contemporary and traditional fencing styles. 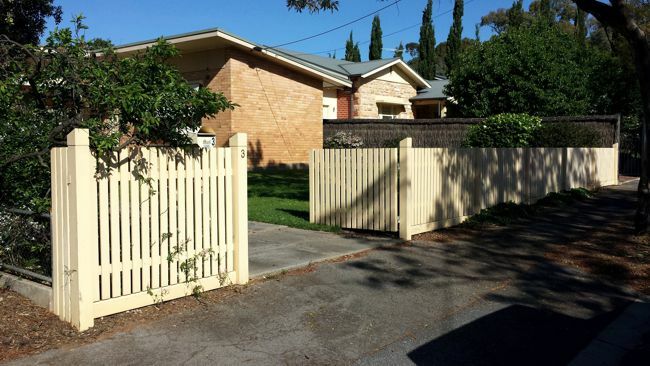 Flat top pickets give square lines. The square lines sit with the uncomplicated house geometry. 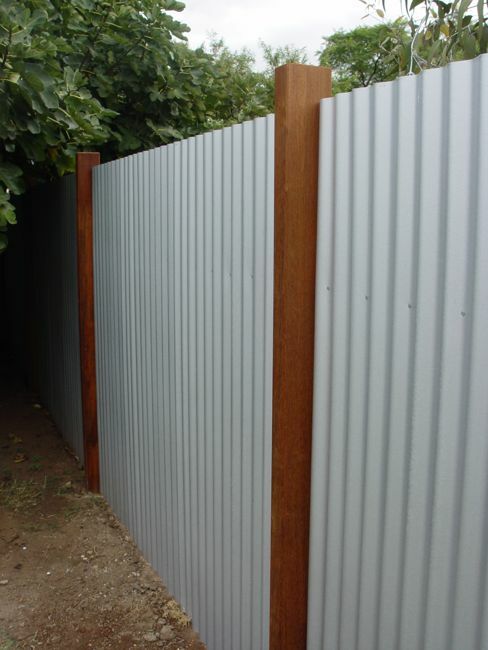 Double Galvanised sheets that will darken naturally with age. 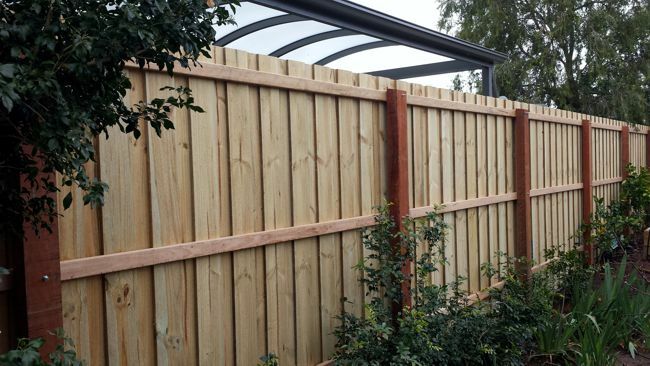 Square top pickets with large pyramid top posts. 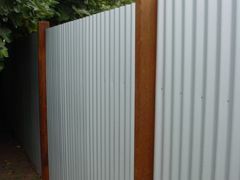 A square recess for the gate to continue the geometry. Another mix of hardwood and iron.